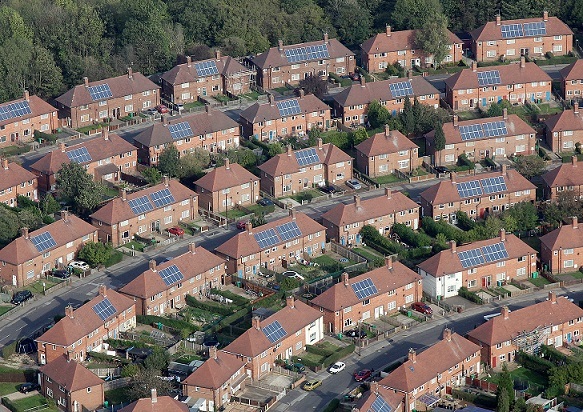 Solar developer Solarplicity is preparing the imminent launch of a low-subsidy residential solar model that could see thousands of housing association properties installed with PV, Solar Power Portal can reveal. Last month SPP reported that Solarplicity had dipped its toes into the energy supply market by acquiring independent supply firm Lo CO2 Energy, emailing customers of the Watford-based supplier to notify them of the change in ownership. This deal has proven to be a vital element of much broader plans to roll-out significant quantities of residential solar in the UK. Speaking to SPP this morning David Elbourne, chief executive at Solarplicity, revealed that the deal was actually an “important addition” to the group which is expected to begin work on the first housing association properties within the next three weeks. The model will see Solarplicity install solar on a housing association’s portfolio with individual tenants signing a power purchase agreement which essentially sees the company become their electricity provider. Solarplicity sells electricity produced by the solar system to the tenant, as well as any additional electricity the household requires. The latter is sold to the house at what Solarplicity has termed a “fair market price”, guaranteed to be lower than that of the ‘Big Six’. Tenants also pay no standing charge in another money-saving departure from other electricity tariffs. Elbourne revealed that the model works by ensuring that properties self-consume around 80% of the electricity they produce, equating to an average solar install size of between 1 and 1.5kWp. All electricity generated by the installations will be sold back to tenants at a discount of 27% on the fair market price, plus tenants will also receive free LED lighting upgrades to reduce their consumption, guaranteed for five years. Projections produced by Solarplicity and seen by SPP show that fair market price equating to around 15.72p/kWh inclusive of VAT, and a gas tariff of 3.3857p/kWh. This would equate to an average household dual-fuel bill of around £932, which falls to £872 including LED lighting savings and then once again to £837 once the solar rebate is factored in. Those projections would constitute an average homeowner saving around £240 annually, boosting housing association attempts to lift more and more tenants out of being at risk of fuel poverty. Meanwhile housing associations themselves will also benefit with a portion of the profits being distributed to them, to be used toward community needs. The model is backed by a major European investor that Elbourne was not at liberty to name. Three housing associations are currently lined up to start rolling out the new model and Elbourne expects to commence installing around 100 systems each week. But Solarplicity claim to have a pipeline which would see them ramp up to around 500 – 600 systems within the next six months. Such a figure would effectively double residential solar deployment in the UK at the current rate of installation. Solarplicity will also look to introduce an option for battery storage into the model in the coming months, with Elbourne insisting price was not so much of an issue. “It's on getting the right product partner. I think prices are pretty much close to where they need to be. We're still in discussion with two or three product partners. “We think the home should be a smart home, so if we're going to add in storage it makes sense to use that when it's most needed - so peak demand, not just when the homeowner wants it,” Elbourne said.